Businesses and corporations revolve around meetings. There are meetings between department heads, clients, employees, and human resources. Pretty much every aspect of business requires a meeting of one kind or another. As such, meetings can also be one of the biggest drains on your bottom dollar. Unorganized meetings can increase the waste in both monetary and production areas. A successful company understands that efficiency and organization are the keys to accomplishment and meetings are no different. This is where a team meeting agenda comes into play. 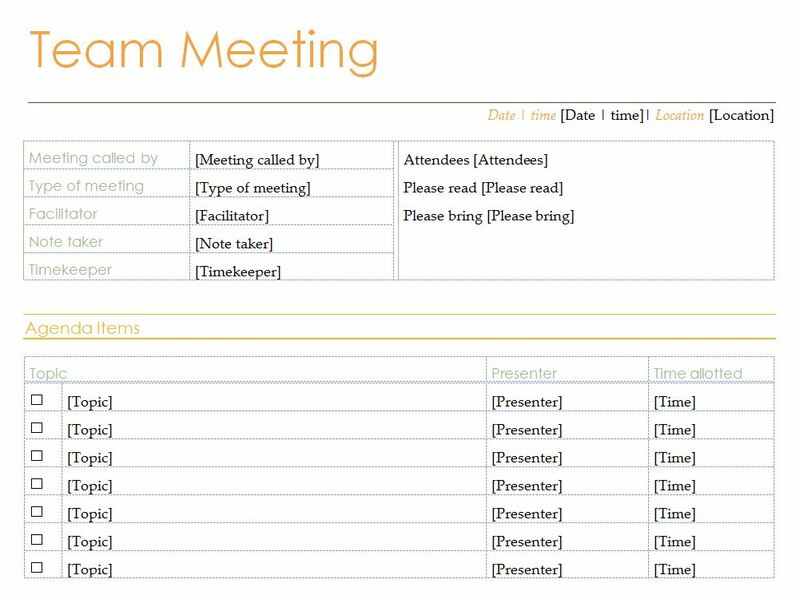 Being able to create a team meeting agenda will increase the effectiveness of a company and its leaders. The Microsoft Word template allows you to keep track of vital information quickly and easily. Another perk is allowing you to save the information to review at the follow up meeting along with action items and owners of projects. Remember to use the same descriptors for the different areas of the form. This will make cataloging the meeting and pulling up later for review much easier.